Love the look of cable rail but don't know where to start? Do not worry! We've compiled all the most important information that you need to know in one handy place so that you can make an informed purchasing decision. 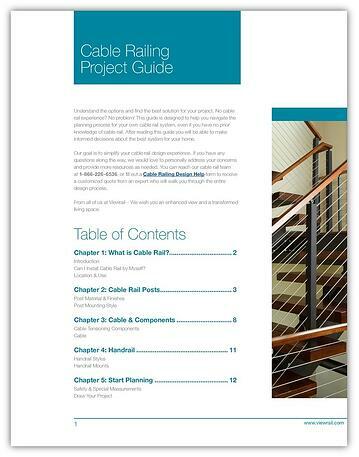 Explain the basic elements of cable rail systems. Educate you about various styles of railing and the pros & cons of each. Walk you through the planning process so you know what you need. Provide helpful tips along the way for staying within your budget. Get the Project Guide Now! Copyright © 2017 StairSupplies™ - All Rights Reserved.